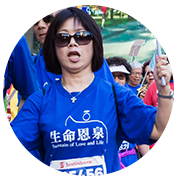 I was very graceful to find out that my sister-in-law, Chi Chun Man (Winnie) will be participating in the FLL Annual Walkathon, Walk with God 2018 in Vancouver. Although Winnie is not a Catholic and just started to know the FLL Ministry, she is willing to give a helping hand. I am very much proud of her big heart! Here in Toronto, I am happy to be her Cheerleader. Please support me by supporting her in support of Fountain of Love and Life! Thank you You from the bottom of my heart! May God’s blessings stay with you always! . Please enter your name and donation amount below. Then click the Support Now button and you will be redirected to the official SVHM (Scotiabank Vancouver Half Marathon and 5K) website where you may enter your Contact information and *Credit Card information* to support Winnie Man, as a group to help to support the meaningful missions of FLL.